Amazon Redshift is a fully managed, petabyte scale, massively parallel data warehouse that offers simple operations and high performance. Customers use Amazon Redshift for everything from accelerating existing database environments that are struggling to scale, to ingestion of web logs for big data analytics use cases. Amazon Redshift provides an industry standard JDBC/ODBC driver interface, which allows customers to connect their existing business intelligence tools and re-use existing analytics queries. Amazon Redshift can run any type of data model, from a production transaction system third-normal-form model, to star and snowflake schemas, or simple flat tables. As customers adopt Amazon Redshift, they must consider its architecture in order to ensure that their data model is correctly deployed and maintained by the database. This post takes you through the most common issues that customers find as they adopt Amazon Redshift, and gives you concrete guidance on how to address each. If you address each of these items, you should be able to achieve optimal performance of queries and so scale effectively to meet customer demand. Amazon Redshift is a column-oriented database, which means that rather than organising data on disk by rows, data is stored by column, and rows are extracted from column storage at runtime. This architecture is particularly well suited to analytics queries on tables with a large number of columns, where most queries only access a subset of all possible dimensions and measures. Amazon Redshift is able to only access those blocks on disk that are for columns included in the SELECT or WHERE clause, and doesn’t have to read all table data to evaluate a query. Data stored by column should also be encoded (see Choosing a Column Compression Type in the Amazon Redshift Database Developer Guide), which means that it is heavily compressed to offer high read performance. This further means that Amazon Redshift doesn’t require the creation and maintenance of indexes: every column is almost its own index, with just the right structure for the data being stored. Amazon Redshift is a distributed, shared nothing database architecture where each node in the cluster stores a subset of the data. Each node is further subdivided into slices, with each slice having one or more dedicated cores. The number of slices per node depends on the node type of the cluster. For example, each DS2.XL compute node has two slices, and each DS2.8XL compute node has 16 slices. When a table is created, you decide whether to spread the data evenly among slices (default), or assign data to specific slices on the basis of one of the columns. By choosing columns for distribution that are commonly joined together, you can minimize the amount of data transferred over the network during the join. This can significantly increase performance on these types of queries. High cardinality – There should be a large number of unique data values in the column relative to the number of slices in the cluster. Uniform distribution/low skew – Ideally, each unique value in the distribution key column should occur in the table about the same number of times. This allows Amazon Redshift to put the same number of records on each slice in the cluster. Commonly joined – The column in a distribution key should be one that you usually join to other tables. If you have many possible columns that fit this criterion, then you may choose the column that joins the largest number of rows at runtime (this is usually, but not always, the column that joins to the largest table). If skew is a problem, you typically see that node performance is uneven on the cluster. Use one of the admin scripts in the Amazon Redshift Utils GitHub repository, such as table_inspector.sql, to see how data blocks in a distribution key map to the slices and nodes in the cluster. Run the table_inspector.sql script against the table again to analyze data skew. If there is no good distribution key in any of your records, you may find that moving to EVEN distribution works better. For small tables (for example, dimension tables with a couple of million rows), you can also use DISTSTYLE ALL to place table data onto the first slice of every node in the cluster. Amazon Redshift tables can have a sort key column identified, which acts like an index in other databases, but which does not incur a storage cost as with other platforms (for more information, see Choosing Sort Keys). A sort key should be created on those columns which are most commonly used in WHERE clauses. If you have a known query pattern, then COMPOUND sort keys give the best performance; if end users query different columns equally, then use an INTERLEAVED sort key. If using compound sort keys, review your queries to ensure that their WHERE clauses specify the sort columns in the same order they were defined in the compound key. Bear in mind that queries evaluated against a sort key column must not apply a SQL function to the sort key; instead, ensure that you apply the functions to the compared values so that the sort key is used. This is commonly found on TIMESTAMP columns that are used as sort keys. Amazon Redshift, like other databases, requires statistics about tables and the composition of data blocks being stored in order to make good decisions when planning a query (for more information, see Analyzing Tables). Without good statistics, the optimiser may make suboptimal choices about the order in which to access tables, or how to join datasets together. You can use the perf_alert.sql admin script to identify tables that have had alerts about scanning a large number of deleted rows raised in the last seven days. To address issues with tables with missing or stale statistics or where vacuum is required, run another AWS Labs utility, Analyze & Vacuum Schema. This ensures that you always keep up-to-date statistics, and only vacuum tables that actually need reorganisation. During processing of complex queries, intermediate query results might need to be stored in temporary blocks. These temporary tables are not compressed, so unnecessarily wide columns consume excessive memory and temporary disk space, which can affect query performance. For more information, see Use the Smallest Possible Column Size. In some cases, you may have large VARCHAR type columns because you are storing JSON fragments in the table, which you then query with JSON functions. If you query the top running queries for the database using the top_queries.sql admin script, pay special attention to SELECT * queries which include the JSON fragment column. If end users query these large columns but don’t use actually execute JSON functions against them, consider moving them into another table that only contains the primary key column of the original table and the JSON column. If you find that the table has columns that are wider than necessary, then you need to re-create a version of the table with appropriate column widths by performing a deep copy. Amazon Redshift runs queries using a queuing system known as workload management (WLM). You can define up to 8 queues to separate workloads from each other, and set the concurrency on each queue to meet your overall throughput requirements. In some cases, the queue to which a user or query has been assigned is completely busy and a user’s query must wait for a slot to be open. During this time, the system is not executing the query at all, which is a sign that you may need to increase concurrency. First, you need to determine if any queries are queuing, using the queuing_queries.sql admin script. Review the maximum concurrency that your cluster has needed in the past with wlm_apex.sql, down to an hour-by-hour historical analysis with wlm_apex_hourly.sql. Keep in mind that while increasing concurrency allows more queries to run, each query will get a smaller share of the memory allocated to its queue (unless you increase it). You may find that by increasing concurrency, some queries must use temporary disk storage to complete, which is also sub-optimal (see next). If a query isn’t able to completely execute in memory, it may need to use disk-based temporary storage for parts of an explain plan. The additional disk I/O slows down the query; this can be addressed by increasing the amount of memory allocated to a session (for more information, see WLM Dynamic Memory Allocation). Based on the user or the queue assignment rules, you can increase the amount of memory given to the selected queue to prevent queries needing to spill to disk to complete. You can also increase the WLM_QUERY_SLOT_COUNT (http://docs.aws.amazon.com/redshift/latest/dg/r_wlm_query_slot_count.html) for the session from the default of 1 to the maximum concurrency for the queue. As outlined in Issue #6, this may result in queueing queries, so use with care. 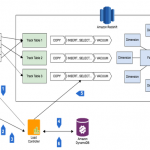 Amazon Redshift is designed for analytics queries, rather than transaction processing. The cost of COMMIT is relatively high, and excessive use of COMMIT can result in queries waiting for access to a commit queue. If you are committing too often on your database, you will start to see waits on the commit queue increase, which can be viewed with the commit_stats.sql admin script. This script shows the largest queue length and queue time for queries run in the past two days. If you have queries that are waiting on the commit queue, then look for sessions that are committing multiple times per session, such as ETL jobs that are logging progress or inefficient data loads. Amazon Redshift best practices suggest the use of the COPY command to perform data loads. This API operation uses all compute nodes in the cluster to load data in parallel, from sources such as Amazon S3, Amazon DynamoDB, Amazon EMR HDFS file systems, or any SSH connection. When performing data loads, you should compress the files to be loaded whenever possible; Amazon Redshift supports both GZIP and LZO compression. It is more efficient to load a large number of small files than one large one, and the ideal file count is a multiple of the slice count. The number of slices per node depends on the node size of the cluster. By ensuring you have an equal number of files per slice, you can know that COPY execution will evenly use cluster resources and complete as quickly as possible. An anti-pattern is to insert data directly into Amazon Redshift, with single record inserts or the use of a multi-value INSERT statement, which allows up to 16 MB of data to be inserted at one time. These are leader node–based operations, and can create significant performance bottlenecks by maxing out the leader node network as data is distributed by the leader to the compute nodes. Amazon Redshift provides temporary tables, which are like normal tables except that they are only visible within a single session. When the user disconnects the session, the tables are automatically deleted. Temporary tables can be created using the CREATE TEMPORARY TABLE syntax, or by issuing a SELECT … INTO #TEMP_TABLE query. The CREATE TABLE statement gives you complete control over the definition of the temporary table, while the SELECT … INTO and C(T)TAS commands use the input data to determine column names, sizes and data types, and use default storage properties. These default storage properties may cause issues if not carefully considered. Amazon Redshift’s default table structure is to use EVEN distribution with no column encoding. This is a sub-optimal data structure for many types of queries, and if you are using the SELECT…INTO syntax you cannot set the column encoding or distribution and sort keys. If you use the CREATE TABLE AS (CTAS) syntax, you can specify a distribution style and sort keys, and Redshift will automatically apply LZO encoding for everything other than sort keys, booleans, reals and doubles. If you consider this automatic encoding sub-optimal, and require further control, use the CREATE TABLE syntax rather than CTAS. This way, you retain the functionality of using temporary tables but control data placement on the cluster through distribution key assignment, and take advantage of the columnar nature of Amazon Redshift through use of column encoding. The last tip is to use diagnostic information from the cluster during query execution. This is stored in an extremely useful view called STL_ALERT_EVENT_LOG. Use the perf_alert.sql admin script to diagnose issues that the cluster has encountered over the last seven days. This is an invaluable resource in understanding how your cluster develops over time. Amazon Redshift is a powerful, fully managed data warehouse that can offer significantly increased performance and lower cost in the cloud. While Amazon Redshift can run any type of data model, you can avoid possible pitfalls that might decrease performance or increase cost, by being aware of how data is stored and managed. Run a simple set of diagnostic queries for common issues and ensure that you get the best performance possible. UPDATE: This blog post has been translated into Japanese.